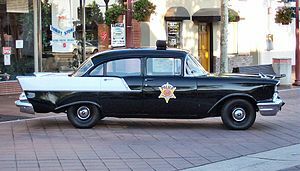 A 1957 Chevrolet police car. Unusually, rather than contrasting panels this uses a factory two-tone also available to the public. Black and white is an American slang term for a police car that is painted in large panels of black and white or generally any "marked" police car. Historically, this scheme was much favored by North American police forces because it allowed the unambiguous recognition of patrol units from a significant distance. However, as the color scheme is not standardized, each police agency in Canada, Mexico, and the U.S. can choose their own color scheme. The most common variant of the black and white color scheme is white roof and four white doors, the second most common is white roof and only the two front doors. In Finland and Sweden, the black and white police cars had black roofs to make them visible in high snow. The Rio de Janeiro Civil Police use a black and white livery, top half of the car white and bottom half black, with the black sloping downwards as it nears the front of the car. Calgary Police Service has been replacing its blue and white Ford Crown Victoria cars with black and white Ford Police Interceptor Sedans since as early as September 2013. Edmonton Police Service returned to the black and white colour scheme for newly acquired vehicles starting in 2011; existing vehicles retain their white colour scheme. Abbotsford Police Department of Abbotsford, British Columbia now has a black and white scheme for their vehicles. Saanich Police have chosen a blue and white version for their cars. South Coast British Columbia Transportation Authority Police Service in British Columbia also uses a black and white scheme. Vancouver, Victoria, Port Moody, New Westminster, and Central Saanich are all using black and white police cars. West Vancouver Police Department in British Columbia also has started to use the black and white livery. Ontario Provincial Police has recently (2007) reverted to a black and white scheme for their fleet. The force used this scheme on their police cars from 1941 to 1989, earning them the nickname "Holsteins" during that period, especially in the 1950s. Until 1998, all Carabineros de Chile vehicles were painted with the same pattern that LAPD uses. These days the vehicles are painted with a pattern that includes green and white, this make the cars looks like the police uniform that is all green. Finnish police van colloquially known as the "Musta Maija" ("Black Mary"). Finnish police vans are colloquially known as the "Musta Maija" ("Black Maria"). Since Finland is a bilingual country, police patrol vehicles feature the text "Police" in both Finnish ("Poliisi", on the vehicle's right side) and Swedish ("Polis", on the driver's side). French police vehicles were painted like the Swedish ones before resorting to all white with red/white/blue striping. In 2018, Paris Police decided to lease 16 eGolf, dressed in a black and white retro style. During the 20th century, the Iranian police used black and white cars. They now use green and white. The Mishteret Yisrael use a black and white livery on their cars. All Japanese police force vehicles are painted and marked in the same ways. Japanese police vehicles are painted black and white with the upper parts of the vehicle painted white. However, motorcycles are usually all white and riot control and rescue vehicles are painted a steel blue. Nissan Skyline GT-R police car. A Japanese police car (Nissan Crew). A Japanese police van (Nissan Caravan). Nissan Cedric patrol car in Japan. Mitsubishi GTO Japanese police car. 4th-gen Subaru Legacy Japanese police car from Aomori Prefecture. All Traffic Police cars of the Ministry of Transport throughout the 1970s and 1980s were black with white doors and roof. This distinguished them from the all white cars of the New Zealand Police. The Traffic enforcement functions of the MOT were merged into the New Zealand Police in 1992. Today NZ Police vehicles are single colour, usually white, often with Battenberg markings. Until the middle 1990s, the vehicles of the Lisbon Municipal Police were painted with the same pattern of the Los Angeles Police Department. The black and white livery of the vehicles reflected the colors of the Flag of the City of Lisbon. Since the middle 1990s, the vehicles of this police force are entirely white, with a stripe along the sides checkered with the black and white gyronny field of the Flag of Lisbon. Police in Madrid use black and white cars. 1974 Plymouth Valiant Swedish police car in the period black and white paint. Swedish police vehicles were originally painted black and white, but in the reverse of the Californian-style pattern. Swedish police vehicles had black roofs, doors, trunk and bonnet or black roofs, bonnet and boot. This came out of necessity, due to the heavy snowfall in Sweden as with high snow obscuring everything but the roof a white roof would be hard to see. In slang they were named black-and-white people-catchers. Taichung police use black and white cars. Like most police agencies throughout southern California, the Los Angeles Police Department vehicles are ordered painted in black clearcoat with the roof, doors, and pillars painted white from the factory. Three vehicles are approved for use within the Los Angeles Police Department, they are the Ford Taurus, Ford Explorer and the Dodge Charger. Only the sedans are permitted to engage in a vehicle pursuit, pursuant to department policy. Options available from Ford ordered by the department include the handle-bar spotlights, 16-inch heavy duty steel wheels with chrome center caps, and ballistic panels within the two front doors. Installed equipment includes the lightbar, front-grill siren and control box from Federal Signal Corporation, the digital two-way radio by Motorola, a notebook PC to function as the Mobile data terminal, and a partition to separate the prisoner rear seating from the driver and front passenger seats. The so-called "A-cars" and "X-cars" (eXtra patrol) also have a shotgun mounted between the front seats in front of the partition. Most police vehicles bear at least two rear bumper stickers: one reading "There's NO Excuse - For Domestic Violence" and another for "DARE" Drug Abuse Resistance Education. On the rear side panel is a black and white sticker that reads "EMERGENCY DIAL 9-1-1 Fire Police Medical." The front doors bears the seal of the City of Los Angeles, the department slogan "to protect and to serve" as well as the citywide five-digit "shop number" and city department name (POLICE). The last three numbers of the shop number (used to identify all vehicles operated by the city) are reprinted on the roof to help air units visually identify cars. On the trunk is a number that identifies which division the unit belongs to (e.g. a 25 would be "South Traffic Division" or a 3 would be "Southwest Area"). Two Ford Crown Victoria police cruisers from two neighboring towns in New Jersey, one being a Black and White.